Electronics retailer Best Buy has quietly removed all 12-inch MacBook models from its U.S. online store this week, fueling anticipation that Apple will refresh the ultra-thin notebook lineup in the near future. The authorized reseller now lists all 12-inch MacBook models as "no longer available" on its website, whereas some remained available for purchase or in-store pickup as recently as this weekend. Select MacBook Air models are also on sale for $150 off, potentially signaling that a broader Mac refresh could be imminent. Most current machines are historically due for an update, and appropriate Intel Skylake processors are now widely available. However, it should be noted that Best Buy frequently offers sales on Apple products. 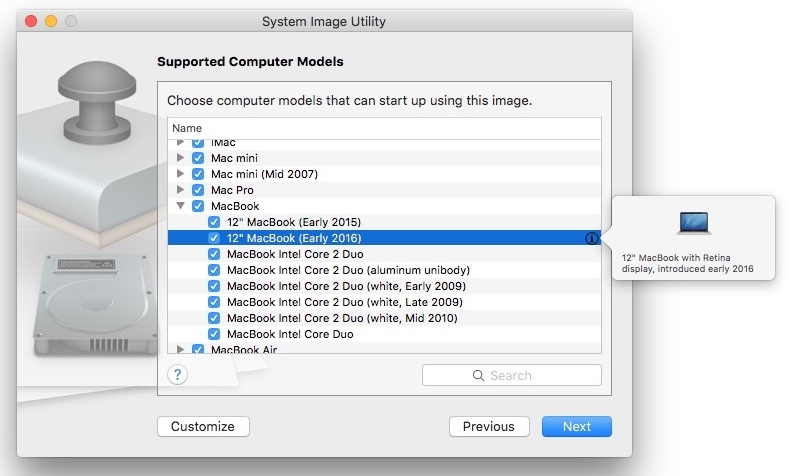 Last month, reference of an early 2016 Retina MacBook, which has yet to be released, was discovered within OS X's System Image Utility application, spurring hopes that Apple will refresh the 12-inch MacBook by late April. Apple has historically used the "early" model identifier for devices that launch during the first four months of the year, so Best Buy removing 12-inch MacBook stock is yet another indication that Apple may refresh the notebook within the next two weeks. If the refresh is in May or later, a "mid 2016" model identifier will likely be used. Our Mac Buyer's Guide indicates that it has been 374 days since Apple released the current 12-inch MacBook on April 10, 2015, so it would be appropriate timing for a refresh. The notebook will likely be powered by Intel's low-power Skylake Core m3-6Y30, Core m5-6Y54, and Core m7-6Y75 processors. 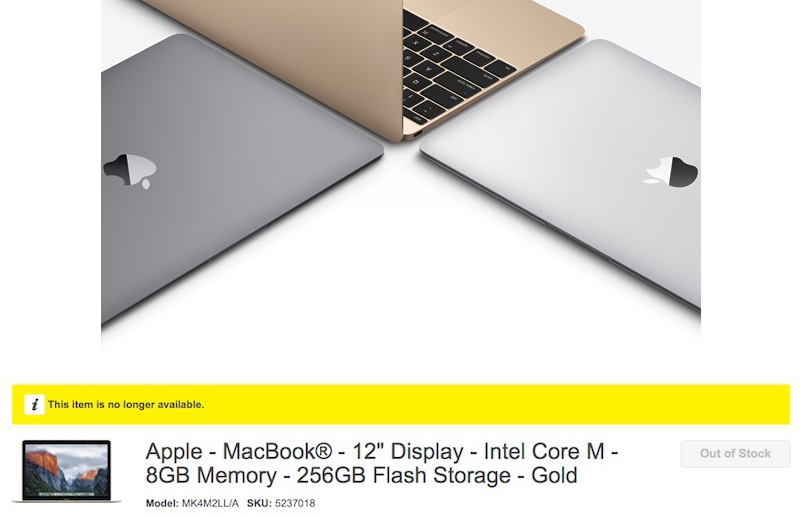 Update: Select 12-inch MacBook models are also listed as out of stock at MacMall. I know for a fact a new model is imminent. How? Simple, I just recently bought one. Great, now put a quality processor in there and drop the price to a reasonable level. Refresh the price while your at it. Personally want a Retina MBA refresh. 2 or 3 Thunderbolt 3 ports (USBc) + SD-Card + lighter and possibly 14" with thinner bezels. And kill the 11" MBA. No need for it and lower price of MB to make it entry model. When will people realize that the new 12" MB IS the retina MacBook Air? I use the entry level of last years model for every day use, have had zero issues with it. I edit photos, videos and even screen capture material from my phone. Depending on what they change I may pick up this years and sell last years. People should try these out, they aren't "slow" like the reviewers make them out to be. Ok maybe you'll argue there's some laptops around 2 lbs that have faster CPUS -- like maybe the LG gram right? Well it's over 10% heavier, it's skylake and has about half the battery life. Also it uses magnesium and Apple isn't set up to mass-produce magnesium laptops. If you want a REALLY small/light machine at some point you WILL compromise on performance. Acting like Apple made some kind of mistake with the Core M is foolish. That machine is not a Netbook. It can play 4k youtube video with no frame drops. It's pretty damn good. I personally can't wait for the skylake refresh. I would hardly call the core M processor crappy.I was amazed at how well it works. Try one out, then post how crappy they are, NOT. Even if it's a minor update, at least they're paying attention to it, unlike the Mac Pro and Mac mini. Please either give it either a reduced price or increase the specs on the new model. I don't get the $1300 price tag; just buy a MacBook Pro for that price!